The small brown she-cat padded silently into the camp clearing, relishing the fresh feel of soft soil against her pawpads. She stretched, kneading the earth briefly before she sat and looked around. The clearing seemed empty, and Fallenstar frowned slightly. It wasn't that she was an overly social cat, but she liked the company of one or two even in the worst of her moods. She blinked and looked at the morning sky; maybe the reason was simply that no one else had woken up yet. She considered the thought of going out to hunt, but decided it would be better to wait for a few of her clan mates to wake up so she could possibly hunt with them. She was in a good mood today, so she wouldn't mind even if they failed the hunt though it was unlikely to happen. The blue-grey tom awoken from his slumber in the warriors den. His tail flicked out behind him as he exited the den and blinked his eyes sleepily. When he reached the soft ground of the camp clearing he reached his forelegs forward and extended his claws in a well needed stretch. After rising and shaking out his plush like pelt the toms gaze wondered the clearing until the fell upon the petite beige and brown she-cat with the striking blue gaze. Seeing his target the tom dropped into a hunters crouch and slowly made his way towards the leader of Foxclan. He took his steps lightly and silently until he was in striking distance. When he had the chance the tom leaped at FallenStars stiff tail and gently took it into his forepaws as he rolled to his flank, in hopes to play with it for a brief moment. The tom was a playful one, always acting much like a kit in his free time in order to keep the 38 moon cat young at heart. Fallenstar jumped up the instant she felt pressure on her tail, and turned intending to snarl at whoever thought it was funny to sneak up on her. The snarl died before it was voiced as she recognized Riverfoot, and shook her head with a bemused expression. "You never change huh?" The she-cat said, deciding to play along as she twitched the tip of her tail so it tickled his nose lightly. She didn't mind the warrior being playful, but she didn't like being snuck up on. "I suggest next time you at least give some warning. I would have shredded you if I had been in a bad mood; you know I don't like surprises like that in the morning." She scolded gently. "That aside, feel like hunting today?" She asked, though she could just order him to go with her sense she was leader. She was still new to the unlimited authority and was still adjusting to it. The tom purred in amusement at FallenStar. "I'm not the only one who hasn't changed." the tom said with a smirk before batting at the she-cat's tail as she flicked it to tickle his nose. He acted a sneeze before rising to his paws and shaking out his coat once more to rid himself of any debris that may have clung to him. "Of course," he said as he gave a yawn. "I could use some fresh-kill." he mewed before circling the beige and brown she-cat waiting for her to lead the way. His tail whisked back and forth gently as another amused purr rumbled in his chest. The she-cat smiled briefly at the bluish gray tom, and then became serious and all business as she turned to lead the way towards their hunt. Play was good, but the hunt required the full attention of those who really wanted to eat. Maybe they could even get in a patrol while they were out. She strode swiftly towards the hunting grounds knowing Riverfoot could keep pace. She had a feeling it was going to be an interesting day. They returned hours later, in early noon. Fallenstar placed the gathered prey where the fresh-kill pile was and the picked out a black rabbit, which may or may not have been her first catch. She laid down and waited for Riverfoot to join her so they could eat together. Because they had hunted well, there was no need to limit how much they ate though to be safe Fallenstar planned to eat only a few bits of prey and only eat again when it was sun-down. The tom followed in close behind. He gave his Clan leader enough space so she wouldn't feel crowded by him. His tail waved back and forth before moving forward to place his kills and the remaining of FallenStars kills. He snatched the magpie from the pile and then went and laid beside the she-cat. His tail tapped the ground gently awaiting the she-cat to take the first bite being respectful to the she-cat in her leader position. Fallenstar took a minute to defluff the rabbit, and then took a bite. "I wonder what I should say about Jaggedstar at the next clan gathering." She mused aloud. She didn't know if she had to, but thought it was traditional that a new leader acknowledge the former before all the clans at their first gathering as a new leader. She didn't expect Riverfoot to know the answer, as she was only thinking aloud. She didn't want her first impression as the new leader to be bad, so she had been thinking for some time about it. The gathering seemed too close, and yet too far away. She wouldn't have to go before the clans for a while yet, but she was somewhere between impatient and nervous as she tried to imagine herself sitting next to the other clan leaders. The tom listened intently to his friends thoughts as he plucked the black and white feathers from the magpie. When he finished he paused and looked to the she-cat. "Well, what were your thoughts on JaggedStar?" the grey-blue tom asked as he looked from the magpie that was calling out to him before glancing to the leader who needed help with her thoughts. "What you say depends on what you thought of him and how you felt about his life as leader." the tom said in hopes that he could offer her some type of advice that she was looking for. "Jaggedstar... He led the clan as a leader should, he never did anything that affected the clan if he could help it. He sort of seemed like a grandfather to me even though we're not related; he made our clan become as close as family." 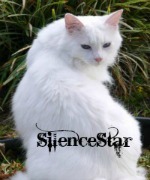 There was a hint of admiration in Fallenstar's voice which she could not hold back; she didn't show many cats out-right respect and admiration often, but Jaggedstar was among the few she would address with such tones. "Of course, he still made apprentice clean mouse-bile off the elders when they were bad." She said, wrinkling her nose a bit playfully and half seriously as she said it.